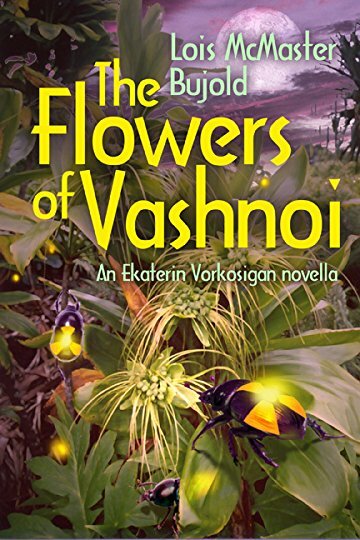 Lois McMaster Bujold’s newest novella, “The Flowers of Vashnoi” (with beautiful cover art by Ron Miller), came out on May 17 (Goodreads announcement), and it’s a good one. If you like Bujold, you will like this novella set in the Vorkosigan’s radioactive district, about four years after Ekaterin and Miles get married. I really like the spirit of experimentation Lois puts into her self-published novels. She’s a pro, and writes well, and has apparently learned good lessons from her time with traditional publishers (I might be wrong: is it natural, or is it L’Oreal?). But now, she’s retired, and she’s been breaking some of the rules in order to tell the stories she wants to tell, without undue stress and story-bending to fit the rules of an outside publisher. For example, this is women’s fiction. (We’re told over and over that women’s fiction doesn’t sell . . . and women’s science fiction? Not even a category. Chick Sci’ Lit? Chicka-Sicca-Fi Lit? Nobody’s labeled it as such.) This is totally Ekaterin’s story, and she isn’t some sweet young single fresh out of school. She’s in her mid-30s with three children, and a husband she loves to bits, but who gets slightly in the way at times. This is her project; she makes decisions as Lady Vorkosigan; and she shares the credit gracefully, but is the boss. Not exactly a common heroine in modern genre fiction. It’s not a love story; it’s not an epic adventure. There are no demons or vampires or werewolves (although there is soupcon of Baba Yaga), but there are some cool bugs that turn widespread radiation into something that can be dealt with. (Not a spoiler: Bujold has been flirting with this since A Civil Campaign. We fans are very lucky to see it happen on the page.) A dash of love, a dash of horror, a dash of thrills. It isn’t a book. It’s a novella, and runs about 20,000 words – so it’s a nice treat for the afternoon, as well. But “we all know” that publishers like books — and even more, they like series. The kind of thing that makes readers binge for the entire weekend or more.